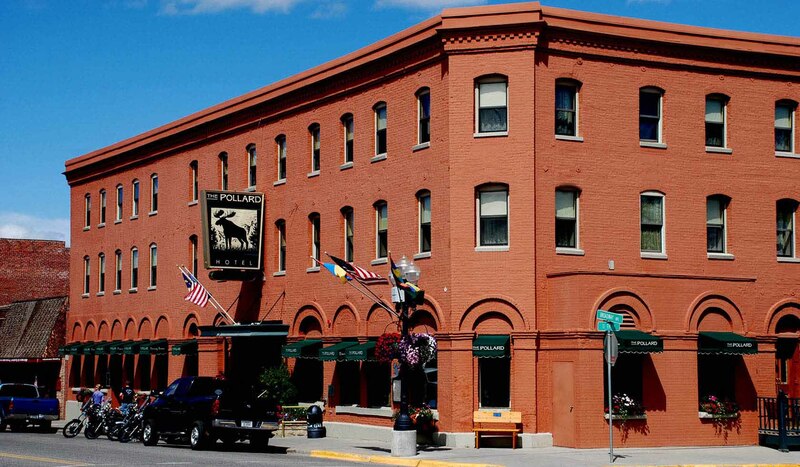 The Pollard, a historic hotel built in 1893 and located in the heart of downtown Red Lodge, has changed since Buffalo Bill and Calamity Jane stayed here at the turn of the last century. Completely restored and reopened in 1994, the hotel has 39 guest rooms and suites, some with hot tubs or balconies. We have three meeting rooms that can host groups of up to ninety. Enjoy our smoke free environment. Our dining room offers an award winning wine list and serves breakfast and dinner. The Pub at the Pollard offers casual dining with a pub atmosphere, and dinner, microbrews, great wines by the glass and a full bar. A full health club and sauna are available for our guests and $10/day for visitors. The hotel is minutes away from world class fly fishing, hiking, river rafting, bicycle riding and horseback rides. In winter, we are a short six mile drive away from Red Lodge Mountain Ski area. In summer, Yellowstone Park is 69 miles away over the scenic Beartooth Highway. The Pollard is on the National Register of Historic Places.